My oldest daughter occasionally stays after Sunday school for a youth group event or Purim play practice or other extracurricular activities. On the days that I am not driving for the carpool and cannot pick up lunch and bring it to her at noon like the good Jewish mother that I am, she takes a sack lunch. This requires a bit of forethought and planning. California roll, fried noodles, Cup Noodles or maybe a Hot Pocket are also acceptable choices. A peanut butter, or even bologna, sandwich is not the status quo. This presents no problems on a regular school day or for the occasional field trip. I insist she add in some healthy items like fruits and vegetables and we strike a decent balance. But when she goes to Temple, none of these are acceptable. We are Reform Jews and choose not to keep Kosher at home. But we do respect the general Kosher style that is observed at our Synagogue: No pork, shellfish, or combination of meat and dairy foods. 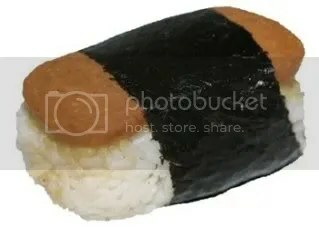 When she realized that Spam musubi and manapua are filled with pork, California roll has imitation crab which seems disrespectful in my book, Cup Noodles contains dried shrimp and Hot Pockets are usually a mixture of milk and meat (at least the ones she likes,) she was shocked. I chuckled. “This is a good lesson for you,” I told her. We had to come up with alternatives. Luckily, she is not completely unreasonable and I have some decent problem solving skills. Not only Spam and fake crab meat go well with rice. You can make a tuna fish salad hand roll or a plain cucumber maki. She likes both of those. Hot rice with a package of roasted seaweed also makes the cut. 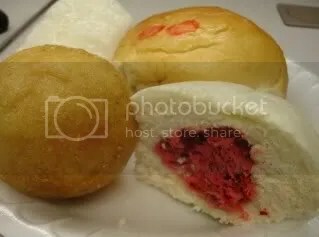 Instead of char siu in the manapua, you can buy them with chicken or vegetables. I know, it’s not the same, but it is a compromise. Of course, she agrees. And, in a pinch, a peanut butter sandwich will do just fine.